Investors and developers can still get a Whopper of a deal as the former Burger King unit in Rotherham town centre failed to sell at a recent auction. Vacant for a number of years, the property at 1 Old Town Hall recently went under the hammer with leading firm, Pugh Auctions at its event at Leeds United Football Club. The freehold of the 4,540 sq ft property, which has trading areas over two floors, was given a guide price of £395,000 but remains available to buy. The majority of the converted Old Town Hall was snapped up by an investor in 2016 having also first failed to sell at auction. Converted in the 1980's into an attractive shopping arcade, the Grade II listed building is now operated on behalf of the privately owned investment firm, FCFM Group Ltd. Following redecoration and renamed "The Mall," it attracted new and relocating retailers with rental offers but a number have since moved out. 1 Old Town Hall is in a highly prominent and prime location at the junction of Howard Street and Frederick Street and directly opposite the interchange where work is underway on a £11.5 revamp. The premises have remained fitted out as a restaurant and have been on the market to rent with rental offers in the region of £57,500 per annum exclusive being invited. In 2009 the property was fitted out into "The Shop of Priceless Things" in a project by artist, Adrian Riley in collaboration with John W Clarke. Artwork on the windows showcased the ideas of the people of Rotherham who were asked to identify the things they value that money just can't buy. Formerly the Town Hall including the County Juvenile Court and Assembly Rooms, much of the building dates from 1896-97. Designed by Mr Lovell of London it features Classical and Jacobean details. 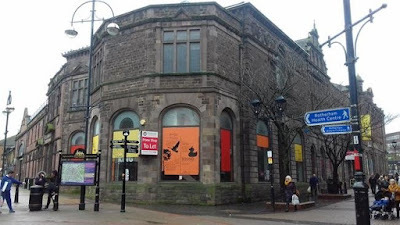 The Assembly Room building (not part of either of the sales), was built as Rotherham and Masborough Literary Mechanics Institute in 1853 and was extensively refronted when incorporated into the Town Hall complex. The Old School of Science and Art, also on the site, is also a listed building. Investors are spoilt for choice when it comes to property in the town centre as there is so much to choose from !